I dug out my old camera this weekend. Since camera phones are the big thing, I rarely think to use it anymore. But, I was preparing to go on an all day hike and, for safety reasons, wanted to keep my phone battery saved up. I also knew I would want to take some epic pics. Anyway, I eagerly waited as I charged the camera battery to see what pictures were last taken and on the memory stick. I was taken on a trip down memory lane as I pulled up pictures from my daughters’ Baby Dedication back in 2014. What struck my heart was how much she has changed since then. She still had those pudgy baby cheeks, that short baby girl hair…all of those traits that melt a mommas heart! She was my baby girl I had always dreamt about! I took a moment to sit back and just look at her today while she was playing at the beach. She still has a little bit of her pudgy cheeks. But, now that baby hair has been replaced by this long beautiful hair (that I’m secretly jealous of). Her tiny baby toes have moved from that “oh they are just so tiny and cute” stage to those are just stinky feet! It made me realize how fast life happens. It made me realize that my last baby is growing up and I need to embrace it. 3 years ago she was this tiny little thing getting dedicated at church and 3 years from now she will be a 1st grader! I love to read while we are at the beach and enjoy a little me time while the kids play. Oftentimes, that’s secretly why I want to go to the beach! I realized I needed to embrace that moment. I put the book down, grabbed my sweet little girl and ran with her out to the ocean. 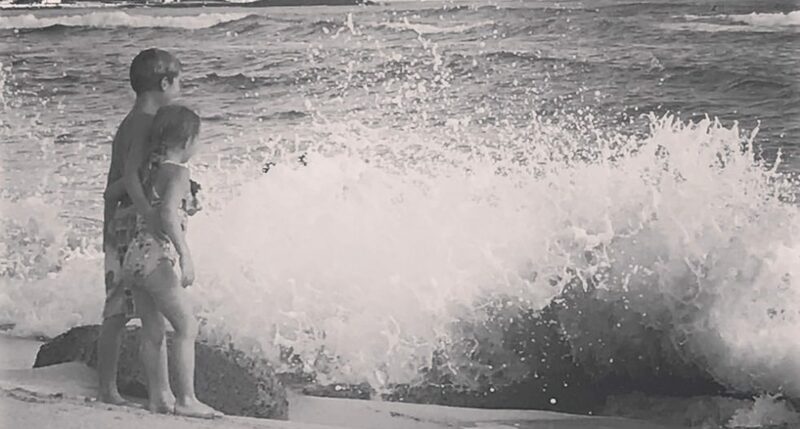 We jumped waves together, splashed and just enjoyed feeing the sun on our faces and sand on our toes-those same toes I realized where going to be as big as mine before I knew it. A day at the beach turned out to be sooo much more than just a day at the beach for me. I encourage each of you ladies to take a minute today to stop-really stop-and look at each of your kids. Are you embracing this stage that they are in? Are you awake right now nursing your baby and wishing you could just be sleeping like the rest of Hawaii?!?! I remember thinking that! Now, I find myself begging for time to just slow down! Just remember…be the mommy you want her to remember! So true, phones and social media can take so much time of our days… it is so important to look up and really notice and spend time with our kids. It’s eye opening to me when we go to the park and every parent has their nose on their phone rather than playing with their child at least for a little bit. It’s been a personal goal of mine to live more presently in their lives! It’s always nice to ever that thought and truly connect with your kids in a way that makes that day truly special and unique. Always good to be reminded! I find myself reading my little “be the mommy you want them to remember” sign daily on our way to school. I keep it my the speedometer in my car….let’s face it! I need the reminder constantly!